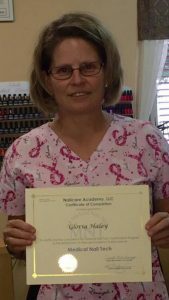 In 2014, a new client came to Gloria Haley for a manicure and pedicure service—turns out she was another nail technician and salon owner nearby in Sebring, FL, and she was looking to retire. She told Haley about her training as an ANT/MNT and Haley was galvanized! 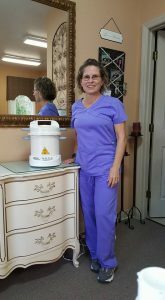 She purchased the salon and moved her business to the new location where she is a sole practitioner who specializes in safe, healthy hand and foot care. She immediately enrolled in the Advanced Nail Technician (ANT) Certification Program and began her study of ten-modules of comprehensive “Safe Salon” training. The clients in her new business expected nothing less, and her clients that moved with her were very impressed with her new focus. In recent months, Haley has enrolled in and completed her second tier of advanced safety training, the Medical Nail Tech Certification Program (MNT). This program is another ten-module comprehensive training program that incorporates a 40-hour internship in a medical foot care setting. It delves more thoroughly into the special considerations those with chronic health conditions must keep in mind when having salon services. She is thoroughly trained to recognize the commonly presented foot (and hand) conditions that she sees in her practice. She can then make an informed decision about whether to proceed with a cosmetic service, and if so, any modifications that might be necessary. For example, a person with Diabetes that is well controlled might have a pedicure if strict aseptic techniques are followed the way Haley does. She adjusts her “traditional” pedicure to allow for the fact that some Diabetics have neuropathy by reducing the temperature of the water and keeping a light, even pressure in her hands, being on high-alert to prevent breaking the skin in any way. For those clients who have conditions that contraindicate having a pedicure, Haley refers them to Olga Luepschen, DPM, of Gentle Foot Care Center. “Dr. Luepschen is wonderful to work with. I did my internship with her and she is good about seeing my clients when I send them to her” Haley shares. “Taking the Internship really put all my training into perspective–it all snapped into place,” she says. As an MNT, Haley works a little differently than traditional salons, “I make sure everyone washes their hands before we start. They fill out the New Client form so that I know more about their medical history. I’m cautious about checking their feet and legs for signs of skin problems such as plantar warts. And I use an autoclave for my stainless steel implements,” she states.